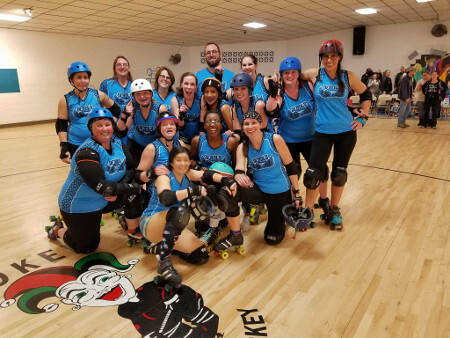 While we at KC Derby Digest were unfortunately unable to attend Fountain City Roller Derby‘s phenomenal-by-all-accounts 2017 season opener, we did have scores and results sent to us as the night went on, and even re-tweeted them, if you were paying attention. Photo provided by Kate Raclin. The real story of the night was the Deadly Sirens‘ win over the defending FCRD champion Lovely Lethals by a score of 57-52. This is a Sirens team that has faced some titanic struggles in the last few seasons and frankly needed some good damn news in the new year. The bout was close at all times — the Ladies in Teal trailed at the end of every period, but by no more than five points — and finally pulled out the win toward the end of the game. Other than their season-ending win over the Royal Pains last spring, I’m hard-pressed to recall another Sirens win in recent memory, so here’s hoping things are finally, finally turning around for this very talented squad. That was the second game of the night. The evening began with the two perennial titans of the league squaring off to get the whole thing started. The Royal Pains led the Shotgun Sheilas by solid margins at every period break and brought home the win 68-42. Based (solely) on the point margins of that bout, the Pains look like the team to beat in 2017, which isn’t a great departure from many other seasons we’ve had recently. But time will tell — if there’s a crazy step-cousin anywhere in this league, it always seems to be Game 1, so we’ll be keeping a close eye on these teams as 2017 goes forward. Fountain City Roller Derby‘s next bout night is February 25 at B&D Skate Center in Independence. Don’t worry, we’ll remind you well in advance. Keep an eye on our Facebook page for updates as well. Thanks to our good friend Kate Raclin over at Zaftig Unicorn Photography for providing us with scores and the above photo. We hope to see everyone out there on the 25th for more FCRD action!